Skoda is looking to go quite aggressive in 2013 when it would come to launching new products and have 6 new launches lined up for 2013 with a new product launch coming every couple of months. Skoda will showcase their 2013 Octavia at the Geneva motor show and after their global premiere of the car at the motor show, will go on to launch 5 new models. They surely are looking to regain some of the lost glory. 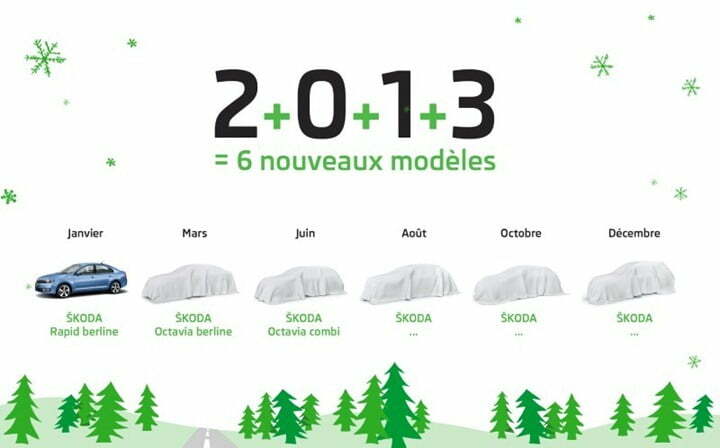 This information comes from Skoda’s Facebook page in France which shows the details about the product launches lined up this year. January will start with the launch of the Rapid in France but we Indians already have that. The Skoda Octavia will premiere in March with the vRS variant (read as performance variant) with turbocharged diesel and petrol engines following it up. June will see a combi variant’s launch for the Skoda Octavia but that would be mainly for the European markets and not us. It is the second half of 2013 that would get the heartbeats racing in India. Skoda will be launching a facelifted version of their flagship sedan, Superb internationally as well as in India and this would probably be the last facelift it gets before it is replaced by a completely new model of the car. The next generation of the car will come in after a couple of years. The facelifted version shall make its way to the Indian dealerships by the festival season which would start around October 2013. The next in line of last refreshes will be the Fabia facelift but that is still a speculation. The new model is due for a launch soon and Skoda might just give its mass-market car a last breath of fresh air. And the year will end with the Yeti crossover getting a facelift which will reach us either in early 2014 or at the same time as the Superb facelift. The Czech car maker is looking to have a boost in sales all over the world and India surely is an integral part of that strategy. Stay tuned to us for latest updates.